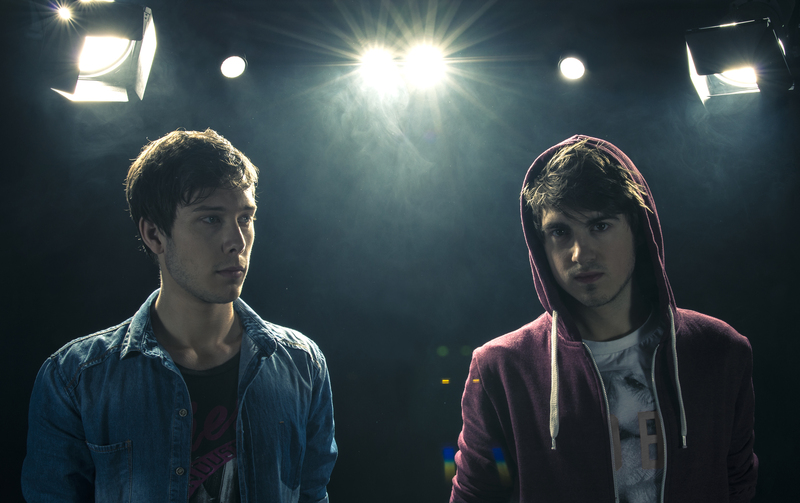 Vicetone hasn’t been around for that long, but they’ve accomplished more in the past few years than most producers ever even set out to achieve. From touring with Nicky Romero to creating not one, but two killer UMF anthems, the two Dutchmen are–for lack of a better expression–killing it. Read on to find out about HBT’s sit-down with Ruben & Victor, and enjoy the peak into the lives of the men who’ve undoubtedly managed to take over your music library. You guys have not only worked with artists such as Zedd and Calvin Harris, but also remixed songs of pop sensations Maroon 5 and Adele. What is it like working with artists from the pop industry and how does it differ from working with those in your industry? Ruben: We worked on our track No Way Out with the singer/songwriter Kat Nestel, and she’s in the pop world so she wasn’t very familiar with the dance world. She has her own people that are very much based in pop music, like she’s living in the pop world and we’re in the dance world, so for us, it’s very interesting because they have different takes on the music. They have other kinds of ideas than what we would have, so it’s a lot of fun to work with people outside of dance music. Do you think that’s what makes you guys unique? What makes you stand out from other DJs/producers? Victor: It’s more songwriter based, actually. We heard that Swedish House Mafia and Eric Prydz were both huge inspirations for you guys at the start. How has their music influenced your own music and style today? Victor: What I loved about their music back in the day was that it was really melodic, and had a completely different feel than all the other stuff on the radio. That was exactly the music I liked: melodic but dance. That’s kind of where we started. Ruben: Yeah, I think tracks like Pjanoo, Leave The World Behind, they were big tracks back in the day. That’s when dance music wasn’t as big as it is now, and we kind of grew up with that sound. They were just huge influences in showing us that style, and they’ve just influenced us ever since we heard those tracks. We also know you’re closely affiliated with Nicky Romero. How’s he affected your career or influenced you so far? Victor: He took us on tour a year and a half ago, and he brought us around Canada for the first time which had a really great influence on us. Working with him was really nice, too. There was a whole new audience we could appeal to using his reach and his fans. Ruben: He helped us a lot with starting out our careers with tips, just general advice. How long have you guys been producing and DJing for? Victor: Producing for three years and DJing for one and a half—almost two. Did you guys start together? Ruben: Kind of. We were just messing around before, but nothing really serious until we started working together and really started doing it. Congrats on coming in 36th on the DJ Mag Top 100 DJs List last year, that must have been very exciting! What was it like hearing about it for the first time? Did you see it coming? Victor: I mean, it was always the list I used to look at years ago to see where DJs were placed, and just to have enough fans voting for you to be first place or top 5, that’s crazy. It was definitely one of the best moments of the year. So you’d say your fans have been instrumental in advancing your career? Ruben: Yeah, their support’s the biggest factor. It’s basically what gives us this job. Thanks to them we can make music not only our passion, but also our work. We can be in the studio every day which is all we pretty much want, so yeah, we owe everything to them. How do you guys reach out to your fans? Ruben: Mostly during shows because there’s direct contact. Like we can send a tweet, and we try to do that, but it’s not the same as if you come to see our show. We always try to stay until the end to take pictures and sign shirts or whatever. We love doing it because we love interacting with our fans. We love the face to face contact. 2014 was such a successful year for you boys and we’re very proud! Any big ambitions for this year? Ruben: And maybe even a free track sometime soon. That’s how we started, so we kind of like to do that from time to time. Just a lot of really good new music. If you like our old songs, you’re definitely going to like our news ones. What do you guys have planned for WMC? What made you decide to move to L.A.? Miami’s pretty fun and popular for this industry, too. Victor: The entire music world is pretty much there. If you want to write songs with other producers, that’s the place to be. Ruben: For music cities in the U.S. it’s either L.A., New York, or Nashville. Those are the biggest three. We just went with L.A. because a lot of pop and dance writers are there. Victor: And it’s pretty much always summer. Ruben: Yeah, it’s always good weather and we’re from Amsterdam so it’s nice to have warm weather now. Playing at huge festivals clearly isn’t new for you guys. What would you say is your favourite thing about festivals like Ultra? Ruben: Just the vibe. There are tons of people coming to see multiple artists, so the common thing they share is just love for dance music. I always think the atmosphere in festivals is just so positive, it’s almost overwhelming. Victor: Especially in Miami. People come from so many different countries, and they all just meet up there to share their love for music. Ruben: Yeah, that’s what’s special. Like the amazing thing is even places like New City Gas, where you can fit thousands of people, it’s crazy, but at a festival you can fit even more. There aren’t really any better clubs or festivals, it just depends on the time of year. Festivals have something special, and clubs have something special that festivals don’t which is the intimacy when people come to see one artist. That’s really fun, too. Last question—just because we’re curious—what programs do you use to produce on? Ruben: We use Ableton. Victor used to work with Fruity Loops, but now we’re exclusively Ableton.